My surgery was on October 26, 1998. I continue to play basketball at the professional level and am STILL amazed and TRULY grateful for what Dr Schifer's procedure did for me. I never think about my neck surgery, unless it is to answer emails from others who are going through what I went through prior to my surgery. It is my pleasure to have been able to help others get independent information to guide them through finding relief for their pain. Feel free to post anything I have supplied regarding my experiences. This is my way of thanking Dr Schiffer for his kind and gentle way, along with his superb skill. My best to all out there. Thank you, for the wonderful results I am experiencing; from the CED procedure you performed on me in October. I am writing this letter for anyone else who is contemplating surgical correction of neck pain, so that they can get some input from someone who has gone through this procedure. I ABSOLUTELY would have no hesitation in having Dr. Schiffer perform any additional procedures on me, should I ever need to have anything else done. I also invite anyone to call me, should they like to discuss what I went through. I can be reached by email at robert_e_bone@yahoo.com , or called at (301) 294-9988. I play basketball at the professional level, and have played on touring teams in ten different countries. In 1996, I made nineteen three-point shots in one minute, at a national shooting competition. I also won the 1996 Triple Crown Sports national one on one championship. 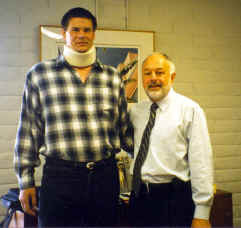 Prior to injuring my neck, I played basketball between four and six hours a day, every day of the week. I practiced for two summers, as a filler player, with the Chicago Bulls at their practice facility. I scored 54 points in one league game, making 17 three-point shots and three free throws. Then on May 4th, 1998, I woke up with a stiff neck. No problem, except it didn't loosen up during the next few days. I continued to play basketball, and figured I would give it a few days. I wasn't going back to France for tryouts, for a couple of weeks. I scheduled some adjustments with my Chiropractor, and had some massage therapy sessions. recommended by multiple neurosurgeons. I had now been taking prescription pain medication for approximately six months, and was looking at enduring a five-hour, major operation. This quite probably would mean the end of competitive basketball, if I were lucky. In addition, I would have a lengthy recovery time. Internet, and began searching for other solutions, as well as more information on the procedures that were being recommended to me. Through a site in Venezuela, I found a site in France, which led me to ultimately find Dr. Schiffer's web site. and try the procedure. I just knew that I would not be happy with the certainty of giving up basketball, and that is what the rest of the medical community was offering. I had an office examination, by Dr. Schiffer, and had some blood work done, in preparation for the CED procedure. I also asked the hospital staff about the procedure, and about dr. Schiffer. They gave me a high degree of comfort, and indicated that they would have no hesitation in having Dr. Schiffer work on them, were they to ever need it. The procedure itself took approximately fort-five minutes, and I was awake the whole time. I was in no pain, whatsoever, during the procedure, though I was careful to pay close attention to what was happening. About two hours after the procedure, I was eating crackers, and having juice. Thirty minutes later, I left the medical center, and headed for a king sized bed at a nearby hotel. I spent the rest of that day in bed, watching lots of television. The next day, I had an examination, by Dr. Schiffer, who indicated that everything was fine. With antibiotics, and some pain medication, I flew back to Chicago, only one day after having neck surgery. I had immediate relief from neck and arm pain, for the first time in six months. Two weeks later, I was gingerly back to shooting baskets, being cautious not from pain, but from not knowing what the limits were. I did not want to cause any injury to a recently operated on neck. It is now June, and I have been working out, and back to playing basketball for several months. My three-point shot is back, and I made a basketball team for the fall. I still have some weight to lose, from months of inactivity, both before and after the procedure, but I am incredibly happy with the results of Dr. Schiffer's work. As I stated earlier, if I ever need to have something like this done again, I would WITHOUT ANY HESITATION, call upon Dr. Schiffer. Please feel free to contact me if there are any questions about my experience with this procedure.